​Frentorish "Tori" Bowie (born August 27, 1990) is an American track and field athlete, who primarily competes in the long jump, the 100 m and the 200 m. She has a personal record of 6.95 m (22 ft 91⁄2 in) for the long jump, set in 2014. She won the bronze medal at the 2015 IAAF Championship in Beijing in the 100 meters. She competed collegiately for the University of Southern Mississippi and was a two-time NCAA champion, winning indoors and outdoors in 2011. She holds the school records for the long jump and was also NCAA runner-up outdoors in 2012. She came runner-up in the long jump at the USA Indoor Track and Field Championships and represented her country at the 2014 IAAF World Indoor Championships. Bowie also competes in sprinting events, holding personal bests of 10.78 seconds for the 100-meter dash, 21.99 seconds for the 200-meter dash, and 7.14 seconds for the 60-meter dash, as well as having a triple jump best of 13.09 m (42 ft 111⁄4 in). She won the Silver medal in the 100m dash and bronze in the 200m dash at the 2016 Rio Olympics. Tori and her sister were born in Sand Hill, Mississippi and adopted at a young age by their biological grandmother. She attended Pisgah High School and began competing in track for the school. She won two state high school championships in the 100 m dash, 200 m dash and the long jump, as well as three state titles in the 4×100 m relay. She also competed in the state team for women's basketball. Bowie gained an athletic scholarship to attend the University of Southern Mississippi, doing an interdisciplinary degree. She represented the Southern Miss Golden Eagles and Lady Eagles inNCAA Division I competitions. Doing both sprints and jumps, she had her best results in the long jump in her freshman year, coming third Conference USA indoors, second at the Conference USA outdoors and reaching the NCAA Women's Outdoor Track and Field Championship, where she jumped in qualifying only. In her second year of collegiate competition she set an indoor best of 6.23 m (20 ft 51⁄4 in) in the long jump and was Conference USA indoor runner-up. At the outdoor Conference USA meet, she came third in the long jump and also made the 100 m final. A personal record of 6.43 m (21 ft 1 in) for the long jump saw her qualify again for the NCAA meet, where she finished sixth in the final. She also jumped nationally at the 2010 USA Outdoor Track and Field Championships, managing eighth place overall. The 2011 season saw her rise to the top of the rankings. She began with a long jump victory at the Conference USA indoors, where she was also runner-up in the triple jump. A jump of 6.52 m (21 ft 41⁄2 in) was enough to win her first college title in the long jump at the NCAA Women's Indoor Track and Field Championship – this was also a school record mark. She was second in both horizontal jumps at the Conference USA Outdoors, then won the NCAA outdoor long jump title with another school record mark of 6.64 m (21 ft 91⁄4 in). For her achievements she was named the conference female athlete of the year. In her final year of college at University of Southern Mississippi, she began with a triple jump win at the Conference USA indoor championships and a personal record of 13.09 m (42 ft 111⁄4 in) for the event. She also managed second place in the long jump. Bowie competed in both jumps at the NCAA indoor championship, but was out of the top eight in both events. Outdoors, she significantly improved her 100 m best that year, dropping from 11.76 to 11.28 seconds. She entered three events at the outdoor Conference USA meet, coming third in the 100 m, first in the long jump with a new school record of 6.78 m (22 ft 23⁄4 in), as well as fifth in the triple jump. In her last major outing for the Southern Miss Eagles she tried to defend her NCAA outdoor title in the long jump, but was beaten by Whitney Gipson and finished second. Bowie began competing in track and field professionally in 2013. In June 2014 she set two new personal records in events 100 m dash & 200 m dash at IAAF Diamond League Championship. At the 2013 USA Outdoor Track and Field Championships she was a 100 m semi-finalist and narrowly missed the long jump team for the 2013 World Championships in Athletics after finishing fourth in that event. She also competed on the IAAF Diamond League circuit for the first time, long jumping at the Adidas Grand Prixand Herculis meets. She continued to improve at the start of 2014, setting indoor bests of 7.14 seconds for the 60 m dash and clearing 6.95 m (22 ft 91⁄2 in) for the long jump in Naperville, Illinois. After a win at the New Balance Indoor Grand Prix, A runner-up finish in the long jump at the USA Indoor Track and Field Championships gained her a spot on team for the 2014 IAAF World Indoor Championships, but she faltered in the qualifying and was eliminated, coming 14th overall. Competed in the Adidas Grand Prix event in Randle's Island New York. Placed first in the BMW Women’s 100 m race with a time of 11:07. Bowie ran 10.91 as the top time in the semifinal at 2014 USA Outdoor Track and Field Championships. 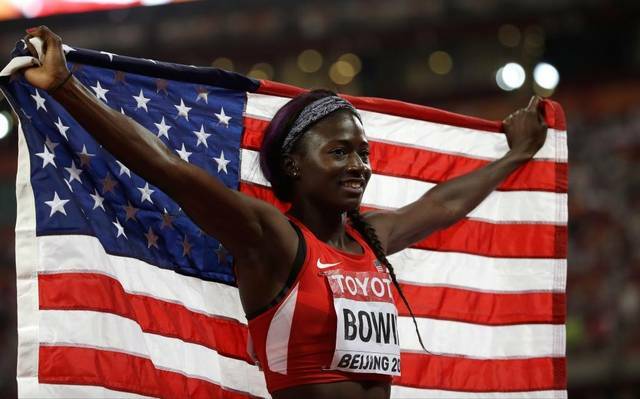 Bowie won in 10.81 2015 USA Outdoor Track and Field Championships to earn a spot in the 2015 World Championships in Athletics – Women's 100 metres where she earned a bronze medal. Bowie placed third in 100 meters running 10.779 at 2016 United States Olympic Trials (track and field). At the 2016 Summer Olympics Bowie placed second at 100 meter dash in a time of 10.83s. Bowie placed third in the 200 meter dash in a time of 22.15s.